Three major types of pipelines are found along the transportation route bringing natural gas from the point of production to the point of use. Gathering pipeline systems gather raw natural gas from production wells and transport it to large cross-country transmission pipelines. 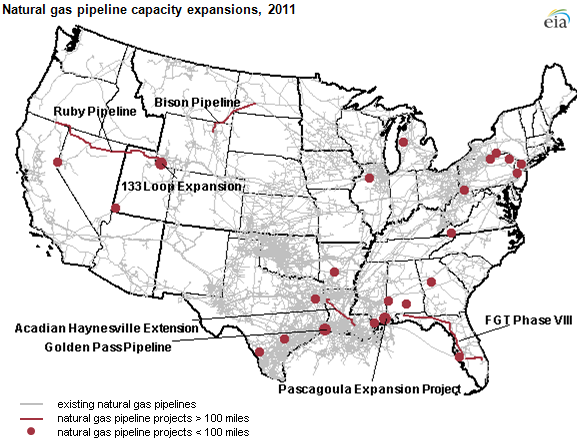 Transmission pipeline systems transport natural gas thousands of miles from processing facilities across many parts of the continental United States. Natural gas distribution pipeline systems can be found in thousands of communities from coast to coast, and distribute natural gas to homes and businesses through large distribution lines mains and service lines. Including both onshore and offshore lines, there are over 300,000 miles of interstate and intrastate transmission pipelines, and 2.1 million miles of distribution pipelines. The Marcellus Shale remains one of the most prolific plays in North America, in terms of both acreage and reserve potential. It is among the fastest growing sources of natural gas production in the United States, rising from less than 1.7 Bcf/d at the beginning of 2010 to 16.4 Bcf/d in July 2015. In Pennsylvania alone, according to state data, operators produced more than 4 Tcf of natural gas -- mostly from the Marcellus Shale -- in 2014 (see Shale Daily, Feb. 17, 2015). Dominion Cove Point LNG, LP (DCP) is a subsidiary of Dominion Resources, Inc. (DRI). DCP owns the Cove Point LNG Terminal, as well as an 88-mile gas pipeline connecting the Terminal to the interstate pipeline grid. The Cove Point LNG Terminal currently has peak daily send-out capacity of 1.8 billion cubic feet (Bcf) and on-site LNG storage capacity of the equivalent of 14.6 Bcf (or 678,900 cubic meters of LNG). DCP’s 88-mile gas pipeline, which has firm transportation capacity of 1.8 Bcf, connects the Terminal to the major Mid-Atlantic gas transmission systems of Transcontinental Gas Pipe Line Company, LLC (“Transco”), Columbia Gas Transmission, LLC (“Columbia”) and Dominion Transmission, Inc. (DTI). DTI is an interstate gas transmission business unit of DRI. The Dominion Cove Point Pipeline has a capacity of 1.8 Bcfd, more than adequate to carry gas to the proposed 1.0 Bcfd liquefaction facility. It has interconnects with Dominion Transmission, Columbia Gas Transmission, and Transcontinental Pipe Line. Dominion Transmission, operator of Cove Point, operates one of the largest underground natural gas storage systems in the United States, with links to other major pipelines. 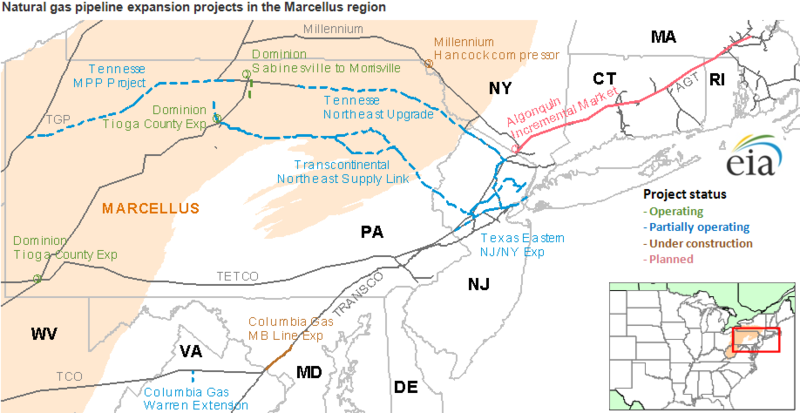 Much of this infrastructure is within the boundaries of the Marcellus shale, supporting its ability to deliver feed gas to the proposed liquefaction project. Cheyenne Plains Gas Pipeline Company, L.L.C. Great Lakes Gas Transport, L.L.C. Ozark Gas Transmission, L. L. C.
Petal Gas Storage, L. L. C.
Riverside Pipeline Company, L. P.
T C P Gathering Co.
Total Peaking Services, L. L. C.
Venice Gathering System, L. L. C.
Young Gas Storage Company, Ltd.